Let us begin today with a prayer. A Show About Nothing: Ramzy's breakdown of Zone-6. Michigan cornerback Jourdan Lewis charged with domestic violence. Help put a statue of Woody Hayes in his hometown of Newcomerstown, Ohio. Word of the Day: El Dorado. HERE COMES THE MASSILLON MAN. Marshon Lattimore, despite national media being unable to locate a proper picture of him, exploded onto the scene in 2016. Many analysts expect he'll be the first cornerback selected. Teams shouldn't sleep on Ohio State's other cornerback, though. After an impressive combine, there are reportedly teams that have Gareon Conley higher on the boards, and it's easy to see why. Those statistics are almost as mind-boggling as me expecting zero drop-off in the secondary after losing three first-round picks. Such is the curse of Urban Meyer's success at Ohio State. GOOD TEAM EYES GOOD PLAYER. The New England Patriots rode to Super Bowl success after Tom Brady sold his soul to the Devil. This much is known. Still, you can't discount the Patriots' eye for a good player and a good deal. DONTRE WILSON: STILL GRINDING. Dontre Wilson, once hailed as "the next big thing" in Columbus, failed to earn an invite to the Senior Bowl and NFL Combine. The @NFL isn't gonna just hand it to @OhioStateFB's Dontre Wilson (@treydayy_). Pertinent note to FOX producers: It's not a "silent grind" if a player films himself after a workout. Good luck to Wilson nonetheless. TERRELLE PRYOR, A DUKIE? Terrelle Pryor signed with OSU in 2008 as the No. 1 dual-threat quarterback in the class. Had he been allowed to play basketball at Duke, however, he might've ended up in Durham, North Carolina. 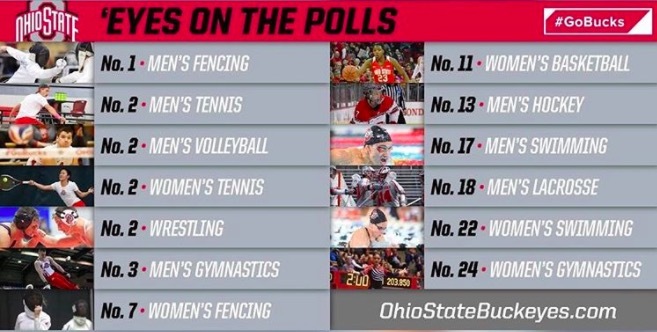 OSU PLAYS OTHER SPORTS. The football team is on spring break and the basketball team is sleeping off the hangover of the century. THOSE WMDs. Lorrie Moore, the art of fiction No. 167... Brazilian soccer club signs goalie who had his ex murdered and fed to dogs... Afraid of jail? Buy an upgrade... 20 years later, Biggie Smalls' murder remains rap's greatest mystery... In search of Forrest Fenn's treasure.